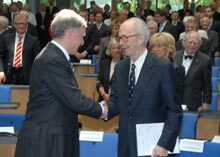 Dr. Horst Köhler, president of the Federal Republic of Germany, greets Lord Ralf Dahrendorf, former FNF chairman. The President of the Federal Republic of Germany, the leader of the German Free Democratic Party (FDP), prominent liberal leaders and descendants of Theodor Heuss and Friedrich Naumann gathered in Bonn, Germany on 19 May 2008 to celebrate the golden jubilee of the Friedrich Naumann Foundation for Liberty (FNF). 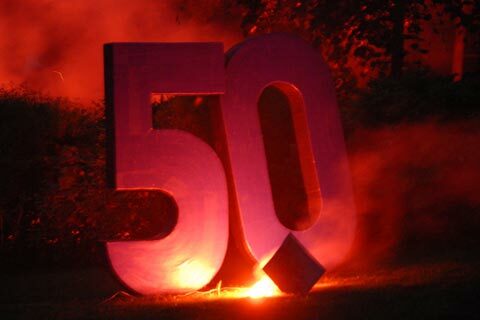 Wolfgang Gerhardt, FNF chairman, led the 1,500 guests in celebrating 50 years of the Foundation’s work. He welcomed the crowd by reiterating FNF’s mission and stressed that its name change underlines the primacy of its work in individual freedom. Dr. Horst Köhler, president of the Federal Republic of Germany, extended the country’s respects and praised FNF’s contribution to the development of democracy locally and internationally. He encouraged the Foundation to continue its mission as liberalism faces many challenges today. One of those challenges is how to balance individual freedom with the struggle for justice and equality. Lord Ralf Dahrendorf, former chairman of the Foundation and member of the British House of Lords, said that a liberal concept of justice must acknowledge the need for some redistribution. It must also offer equality of access, most crucially by offering educational opportunities that mitigate inequalities at birth. This is in order to safeguard a minimum standard of decency for every person. The leader of Germany’s Free Democratic Party, Dr. Guido Westerwelle, acknowledged the need for liberals to tackle issues of justice. However, he cautioned against a simplistic concept that sees massive redistributive policies as the only legitimate form of social justice. He said that this would turn the state into a nanny-in-chief and transform citizens into permanent dependents. Chairman emeritus, Count Otto Lambsdorff, ended the celebration with a panel discussion with several eminent liberals from around the world. They discussed the challenges the Foundation faces globally and what the next steps are for international cooperation. Siim Kallas, member of the European Commission from Estonia; Tony Leon, long time leader of the South African Democratic Alliance and Otto Guevara Guth, a liberal leader from Costa Rica, provided an impressive overview of the international dimensions of the work of the FNF. The Friedrich Naumann Foundation for Liberty was founded in May 1958 by a group of liberals led by the first post-war president of Germany, Theodor Heuss. He named the organization after his mentor Friedrich Naumann.